At Austin Life, we believe the life we are all looking for is found in knowing, loving, and trusting Jesus, and then in giving our lives away for the glory of God and the good of others. We want to lead kids to life in Jesus and we believe The Lord has called us to pass this on to the next generation (Psalm 145, Deuteronomy 6). Your first stop after arriving is the check-in station, located right in the lobby when you first walk in. We want to serve you and your child well, so we will ask for some basic information such as your contact information, allergy information, etc. Then both you and your child will receive a tag with a matching code. Your child’s tag has their name on it and your parent code. Your tag will be used to pick your child up after service. Safety is one of our highest priorities. That's why you'll receive a unique parent identification number each time you check in. Additionally, every Austin Life Kids volunteers is trained to create an atmosphere where families can confidently leave their children while they are in service. Every volunteer is screened with a background check and the area is secure and monitored by personnel. Note: If an issue or emergency arises with your child during service, we will display your child’s tag number on the TV screen located above the stage in the auditorium. From there, simply proceed to the Austin Life Kids check-in area and our team will meet you and inform you of the situation at hand. Austin Life Kids volunteers are not permitted to give any type of medication so please administer medications before or after the service. If your child becomes ill during the service, you will be notified. Play clothes are always welcome! Austin Life Kids is a fun and active environment. Your kids will be playing, singing and dancing as they learn about Jesus in small groups and large groups. Two or three disposable diapers (no cloth diapers, please). A complete change of clothes in case of an accident. Bottle of milk, formula, juice or water (this is a good practice even for mothers who nurse). Snack for your child (we provide a snack of goldfish and water if okayed by parent). PLEASE label all personal items (including pacifiers, blankets, jackets, and sippy cups) with your child’s name before arriving. This helps us keep track of your child’s items. 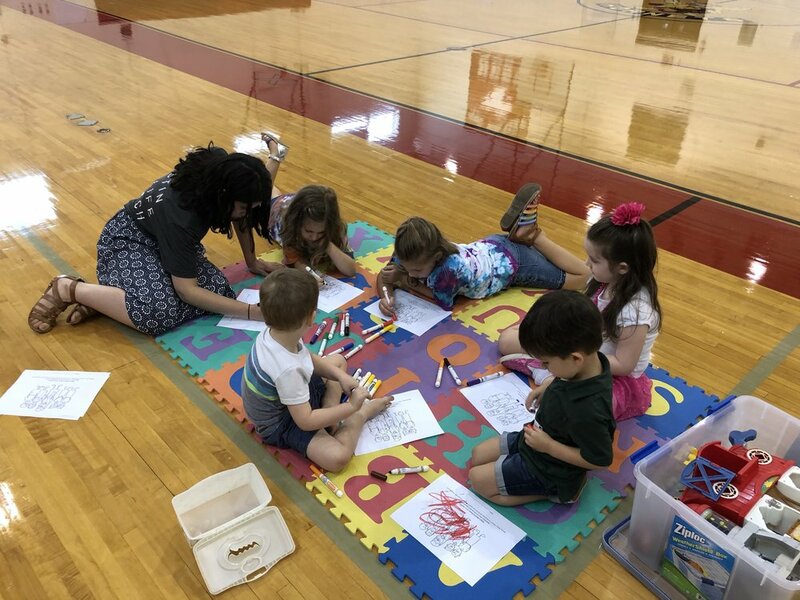 At Austin Life Kids we will have a big group time of Worship with singing and a Bible story, then they will break into age groups (Infants, Preschool, and Kinder-3rd) and have time to recap, have a snack, and complete a craft that reinforces the lesson we learned that week. We teach truths from the Bible, sing songs based on scripture, and pray. Our volunteers have trusted Christ as their personal Savior and desire to share the love of Jesus with your children. We provide the materials, curriculum, and training to equip our team. We want our kids to grow in Christ, build discipleship relationships for the future, teach them to live on mission, and ultimately how to share their faith with others. Kids in 4th grade and up are encouraged to attend the worship service with their family. If you have further questions concerning our Austin Life Kids experience or visiting Austin Life Church with children, simply click the button below and get in touch with us!